Build a Tile is a free Windows 8 Live Tile Maker app that lets you create customized live tiles and pin them to the Start screen. Using this free Windows 8 live tile maker app, you can design live tiles by following some simple steps directed in the app. You can also add important notes, reminders, appointments etc., to these tiles. The option to pin these tiles to the Start screen will always remind and help you keep track of things that you might forget otherwise. 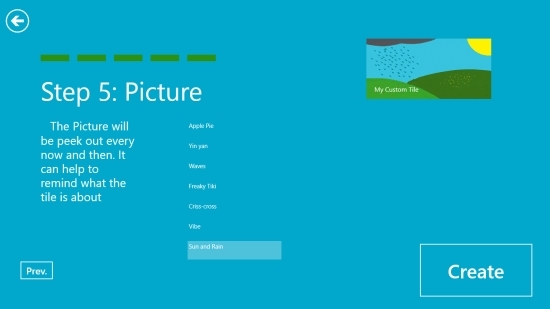 This free Windows 8 live tile maker app is a handy tool. The tiled interface looks quite nice. You can choose text colour, tile color, and some interesting quirky backgrounds that give a nice designer look to your tile. 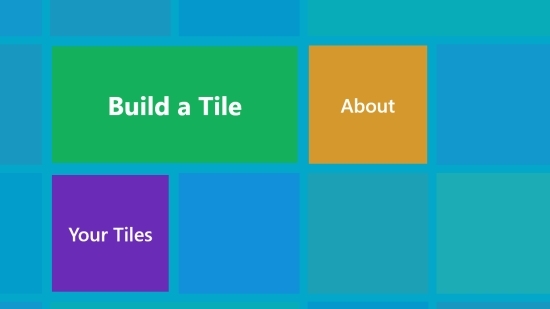 Build a Tile is freely available in Tools category of Windows Store. You can search for the app in Windows Store using Win+Q key combination. To view the app directly in Windows Store, click on the link given below at the end of this post. Let’s have a look at how the app works. 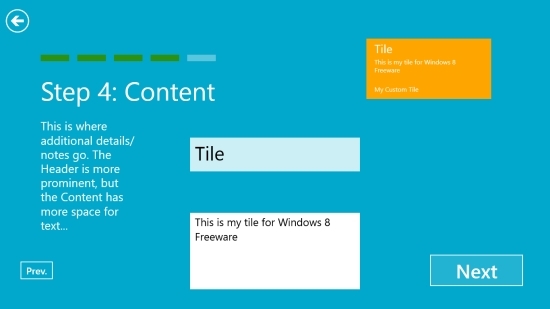 Creating customized live tiles using this free Windows 8 Live Tile Maker is very app. All you have to do is to follow some simple steps directed in the app and you are done! As you launch the app, you will see the tiled interface with three options: Build a Tile, Your Tiles, and About. 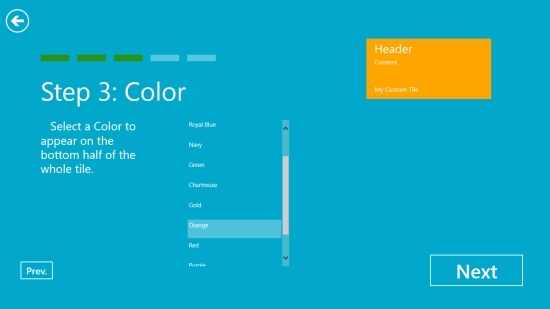 Build a Tile option lets you create customized live tiles. Your Tiles option displays all the tiles created by you. You can view, edit, or delete a tile using this option. The third option About describes what the app does. Click on Build a Tile option to create your customized tile in 5 easy steps. 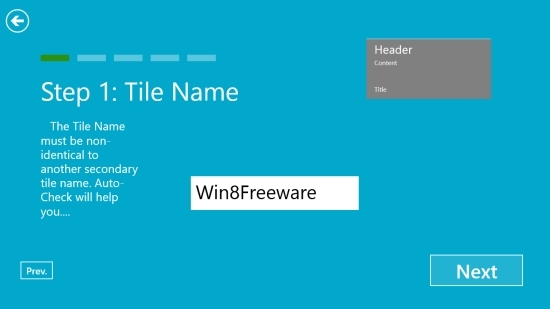 Step 1 – Add a Tile Name. Give a name to your tile to recognize it in the list later. Step 2 – Enter Title of tile. This title gets displayed on the bottom left of your tile. You can also choose text color as white or black. Step 3 – Choose Tile color. The app displays color options to choose from and set it as the color of tile. Step 4 – Add content. You can add a larger content to reflect on the tile. This can be your reminder’s description, message, or any other content. Step 5 – Add background. There are some preloaded backgrounds in the app from which you can select the one you like. This background will flip in the tile giving it a live tile look. You can always see a preview of this tile on the top right corner of each screen. Your customized live tile is ready. The next screen will display the option to pin your customized tile to the Start screen. Click on Pin to Start. You can now switch to your Start screen to see your customized tile. 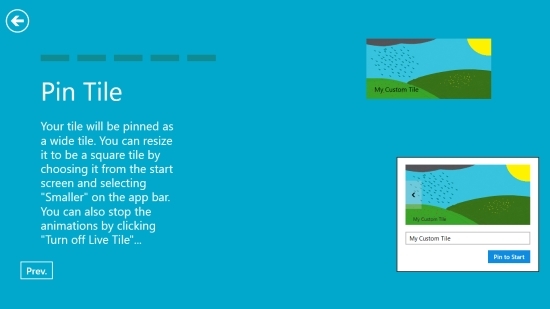 Also have a look at some free Windows 8 live tile reminder apps. 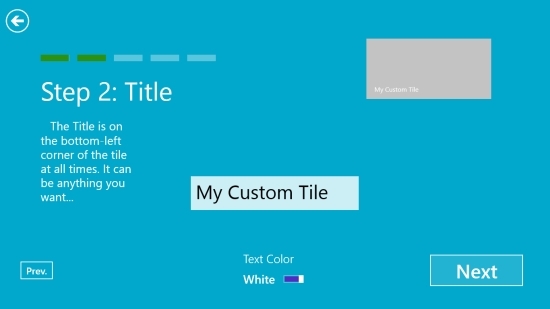 Build a Tile is a nice Windows 8 live tile maker app that lets you design your own customized live tiles and pin them to Start screen. Go ahead, create your own customized live tiles to add notes, reminders, messages, and more. Do share your feedback via comments. Get Build a Tile here! Also check how to turn live tiles on and off in Windows 8.